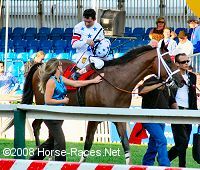 The $1 million Preakness Stakes (G1) is the second jewel of American racing's Triple Crown, traditionally contested on the third Saturday in May at Pimlico Race Course. In contrast to Friday's wet weather, racing conditions on Preakness day were ideal, with sunny skies, a consistent breeze, and temperatures in the mid 70's, drying out the track from muddy to fast in time for the first race. A crowd of 112,222 was on hand at the Baltimore oval for the 13-race card which included 9 stakes races. A field of twelve 3-year-olds went to post in this 1 3/16 mile classic, but only two came out of the Kentucky Derby. As expected, undefeated Big Brown, who won the Derby by 4 3/4 lengths, was sent off as the 1-5 favorite over 9-1 Gayego, who was a distant 17th in Louisville after winning the Arkansas Derby. The rest of the field was at double-digits on the board, led by 14-1 Kentucky Bear, third in the Blue Grass Stakes last out but unable to draw into the Derby field due to insufficient graded stakes earnings. Local hope Icabad Crane, winner of the Federico Tesio Stakes, was the 22-1 fourth choice. Gayego led the field first time past the stands, opening up a clear lead of 1 1/2 lengths through an initial quarter mile of 23.59 and half mile in 46.51. 36-1 Riley Tucker stalked him in second out three wide, while heavy favorite Big Brown settled in third. Kent Desormeaux had Big Brown to the inside of Riley Tucker entering the clubhouse turn but after some light contact with that rival, Desormeaux decided to switch Big Brown to the far outside, 5 paths off the rail, to avoid traffic trouble. Gayego continued to lead the field through 3/4 in 1:10.48 but the fast pace took its toll as both he and Riley Tucker dropped out of contention on the turn. At the same time, Big Brown easily ran by the tiring pacesetters and took over the lead inside the 1/4 pole, getting the mile in 1:35.72. He opened up a 5 1/2 length lead at the 1/8 pole, and cruised under the line 5 1/4 lengths ahead of late-running 40-1 Macho Again, completing the trip in 1:54.80 over the fast track. It was just 1/2 a length back to third place finisher Icabad Crane, who closed well after racing at the back of the pack early. Left: The trophy presentation for the Preakness. Winning trainer Richard Dutrow Jr. said, "Going down the backside when Kent got him out and he was laying third on the outside, I knew it was over. He just bided his time as long as he could. I only saw him ask for run once just to separate himself, then he guided him to the wire. It was beautiful. Kent never hit him with the stick that I could see. 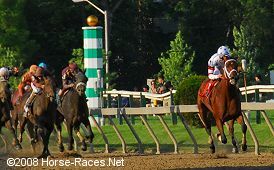 Kent might have asked him to run for 1/16 mile when he turned for home just to put the race away and glided to the wire. 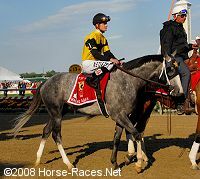 I see he did not get on his belly which was very important for us today, and I'm going to be under the impression that he's going to be awful tough to beat in the Belmont as long as he comes out of it good and trains good up to the race." Right: Big Brown heads up the turf course for the winner's circle. 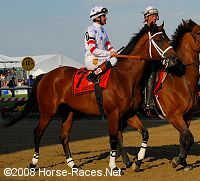 Left: Big Brown returns from the test barn after the Preakness. 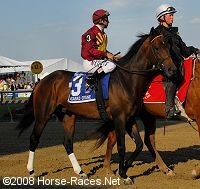 Right: Big Brown in the post parade. Winning jockey Kent Desormeaux said, "In the last corner I looked back under my arms one more time before I asked him to run to see where everybody was, and what I saw was everyone had gotten their horses running and they had looped up to the flight in front of them and they were all having to check their horses to slow them down. So I thought this is a perfect opportunity to, while they're slowing their mounts down, to separate from them." Big Brown got a bath on the grass behind the stakes barn after the Preakness and seemed to enjoy posing for the many people who wanted a look at him. Yes, he really does have a white spot behind his left front leg. 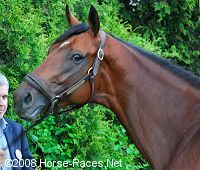 Co-owner Michael Iavarone of IEAH Stables said, "I think the issue with Eight Belles not only affected us but it affected the sport in its entirety. 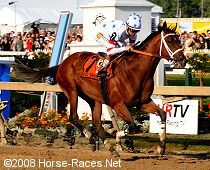 I think it's important now for thoroughbred racing to come together as a whole when you have a horse like Big Brown with a chance to make history. Just the opportunity for us to go back to New York with a chance to do that is just an amazing opportunity for us." Second place finisher Macho Again in the post parade. His trainer Dallas Stewart said, "He really, really ran great. I knew he was a real nice horse and came home great. He hooked a superstar, you know." 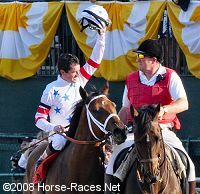 His jockey Julien Leparoux said, "We just got beat by a monster. He might just be a Triple Crown winner. We ran huge and that's very important. This is kind of the best second place I've ever had. I don't like to be second, but it's not bad to be second to this horse." Third place finisher Icabad Crane in the post parade. His trainer Graham Motion said, "What can I say? I thought he ran huge. I thought really he was unlucky not to be second. He got stopped pretty bad at the top of the stretch when the frontrunners started backing up. He really had to get him going again, which I thought was really impressive � that he got back up to be third. Big Brown's a very, very good horse. He's the real deal. It's very exciting for the game." His jockey Jeremy Rose said, "My trip was good to the 1/4 pole. I went after Big Brown, but he just threw dirt on me. My horse ran his heart out, and with a little better trip. I may well have gotten second." 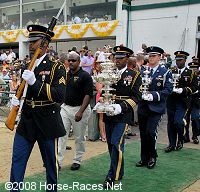 An honor guard carries the Woodlawn Vase over to the winner's circle earlier in the day. The Woodlawn Vase is the permanent Preakness trophy and the most valuable trophy in sports, worth over $1 million. The silver trophy is 34 inches tall, weighs almost 30 pounds, and was created by Tiffany and Company in 1860. The winner gets a smaller sterling silver replica to keep.